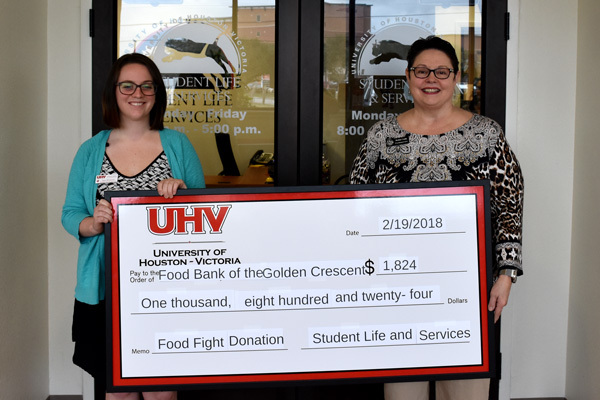 Sara Weinstein, left, a University of Houston-Victoria Student Life & Services coordinator, presents a check Monday for $1,824 to Robin Cadle, CEO of the Food Bank of the Golden Crescent and a UHV alumna. UHV students took part in the annual Food Fight fundraiser by donating the value of meals from their meal plans at Jaguar Hall Dining. The meals were converted into dollars by the university. Many of the students, including one who donated 30 meals, cited a wish to support the food bank and JP’s Market, the student food pantry inside Jaguar Suites residence hall, as their reason for donating.